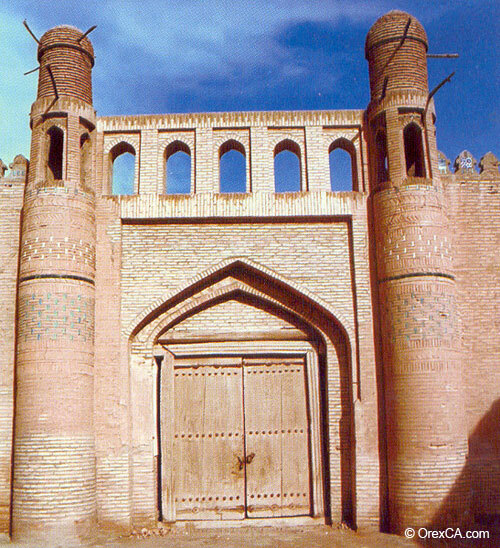 In the period of Allakuli-khan (1825-1842), the political, public and trading center of Khiva had moved to the eastern part of Ichan-Qala. A new complex formed at the gates of Palvan-darvaza: a new palace, madrassah, caravanserai and shopping mall (tim). The palace of Allakuli-khan was named Tash-Hauli ("Stone courtyard"). It looks like a fortress with high battlements, towers and fortified gates. Its architecture is based on the traditions of Khorezm houses and country villas ("hauli") with enclosed courtyards, shady column aivans and loggias. Tash-Hauli consists of three parts, grouped around inner courtyards. The northern part was occupied by the Khan's harem. The formal reception room-ishrat-hauli adjoins the last one on the southeast; court office (arz-khana) - in the southwest. In the center of Ishrat-hauli there is a round platform for the Khan's yurt. Long labyrinths of dark corridors and rooms connected the different parts of the palace. Refined majolica on walls, colored paintings on the ceiling, carved columns and doors are distinctive features of Tash-Hauli decor. 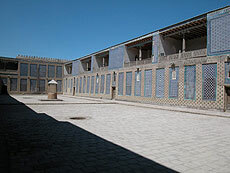 A corridor separated the family courtyard of Tash-Hauli (harem or haram) from the official part. 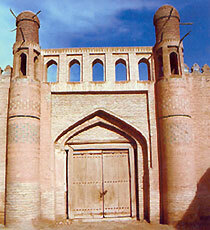 Its southern side is occupied by five main rooms: apartments for the Khan and his four wives. The two-storied structure along the perimeter of the courtyard was intended for servants, relatives and concubines. 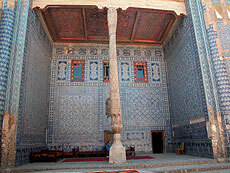 Each aivan of the harem represents a masterpiece of Khivan applied arts. Their walls, ceilings and columns display unique ornamental patterns. Majolica wall panels were performed in traditional blue and white color. Red-brown paintings cover the ceilings. Copper openwork lattices decorate the windows.